ChildChild age: 4- 12 years old. Under 4 are free. 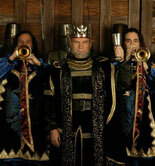 Enjoy a knight's tale and experience one of Florida's most unique dinner attractions. Take a journey back to the 11th century when the splendor, the pageantry and the romance of a time long remembered come to life in a re-created Medieval Times Castle. 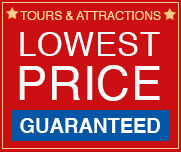 The Kissimmee Castle is the flagship of the Medieval Times family. Opened in December 1983, it was the company's first North American dinner attraction. The attraction has just completed a 6.3 million dollar renovation, doubling the size of the Hall of Arms, new entrance with moat and drawbridge, enclosed ticketing area, and a state of the art kitchen. The Grand Ceremonial Arena seats 1,100 guests and offers performances each evening plus matinee shows during certain times of the year. The journey back to the 11th century begins as visitors are greeted by King and his daughter. Guests receive a colored crown corresponding to their seating area and the Knight they will cheer throughout the show. Guests proceed to their color-coded pavilion as the sumptuous feast begins. With clockwork precision, legions of serving wenches and serfs deliver four courses to hungry guests in minutes. To the special delight of the guests, the feast is served "medieval style" - without silverware, but with plenty of extra napkins. While the feast is being served, the legend of a kingdom threatened by treachery but intimately strengthened by courage unfolds in the Grand Ceremonial Arena. The show has all the lance-splintering action and glorious pageantry guests look forward to with a Medieval Times Dinner and Tournament. Make your reservation today, get your eTicket and experience this exhilarating combination of fun, feasting and fighting - Medieval style! Castles open 90-minutes prior to show time | The schedule of show times varies by season and show times also vary from month to month and day to day | Please call Customer Service for days and times available. The Kissimmee Castle is located 8 miles from Walt Disney World, 10 miles from Sea World and 12 miles from Universal Orlando. Free on Kissimmee Castle grounds. Child's Ticket: 4- 12 years old. 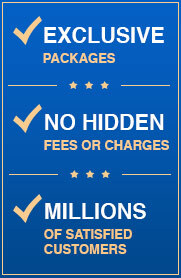 Under 4 are free. Admission price includes the show, dinner and two rounds of select beverages | Cash bar service is available throughout the show | Tickets are non refundable. 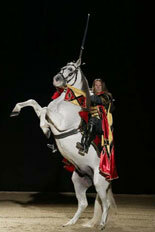 Allergy / Strobe Warning: Medieval Times uses stroboscopic and pyrotechnic effects. 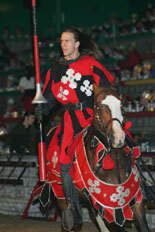 Medieval Times is a live horse show in an enclosed arena. Persons with respiratory conditions, allergies, or asthma attend at their own risk.